Starting with a blank page can be an intimidating way to begin a project. The following design tips are perfect for pairing with this month's City Sidewalks Kit, or just tuck them into your back pocket for a time when your creative mojo is low. Either way, we hope they’ll help inspire your next project! Barbara went all out with the ticket love on her notebook spread, Disney Aulani. We love how she sized her photos to fit inside the tickets and lifted some of them up with dimensional adhesive. 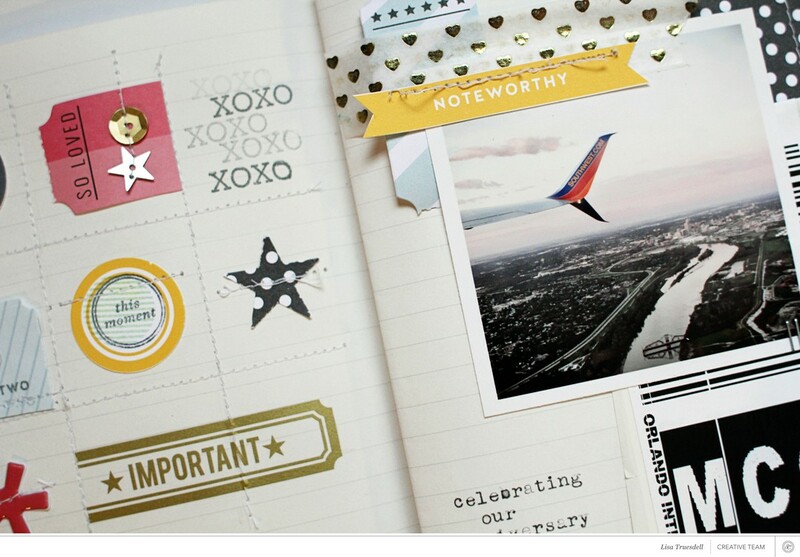 The fun spread is a great way to document lots of photos. Kelly created a collage of tickets die-cuts in the upper half the right page on her spread, S & B. It's a great way to embellish a page and tie in the colors from the patterned paper page on the opposite side. The "captured," "remembered," and "documented" stamps from the Document Winter stamp set are perfect for creating your own custom background. Marcy used all three to stamp out a subtle pattern for her spread, Winter. On her spread, Snow 02, Lisa used the Document Winter stamp set to stamp hexagons and snowflakes creating a unique base for her title and journaling. It perfectly pairs with her photo and story! Marcy flipped her notebook sideways to gain a new perspective for her spread, AM. 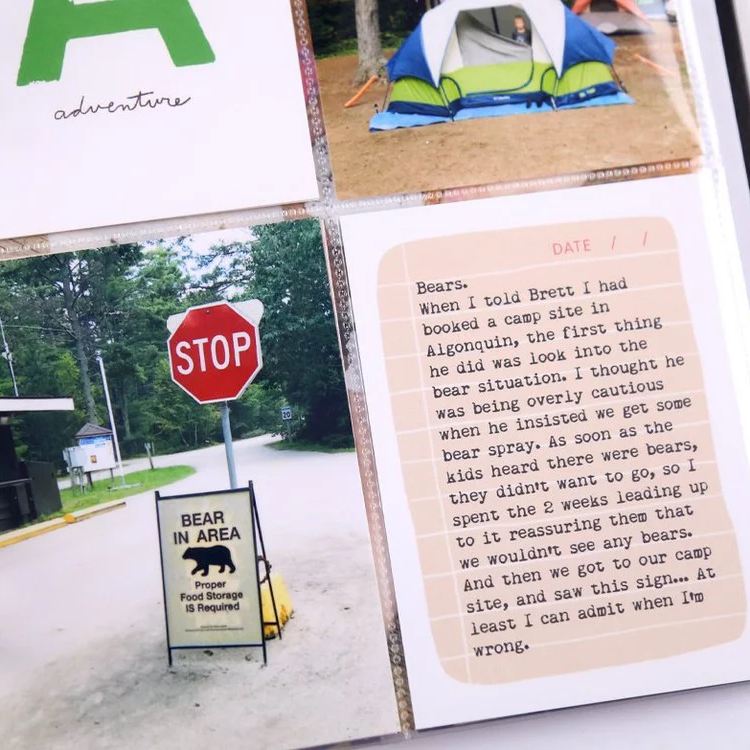 We love the result and how this technique allowed her to include a long, horizontal photo in her notebook. Just because there are two pages to a notebook spread, doesn't mean you have to treat them as separate foundations. On her spread, Simply Amazing, France cut her horizontal photo in two to stretch it across the spine of her notebook. We love how it turned out. Marcy used the same concept when she used this fun page in her City Sidewalks notebook as the base of her project, Wonder Seeker. This technique is great for tying the two pages of a spread together. 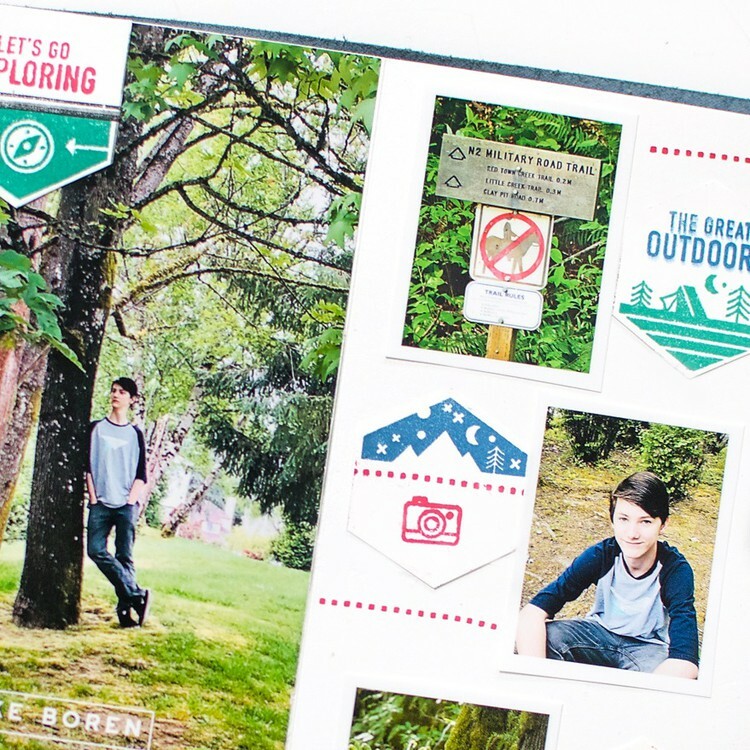 Create a cohesive spread by having your photo and story mirror the patterned paper you use. On her spread, Day in the City, Marie paired her bustling city street photo with the city map patterned paper in her notebook for a fun effect. Lisa mirrored the twinkle lights in the photo of her Christmas tree with the gold star patterned paper from the City Sidewalks notebook on her spread Sparkle. We love the effect she achieved by printing her photo on transparency so that the stars could be seen through her photo.